Today we enjoyed Pete the Cat- Play Ball and Pete the Cat-Pete's Big Lunch to work on our comparing two texts strategy. We talked about what happened in each by using our strategy of Check for Understanding (being able to tell the who and what) after hearing the stories. 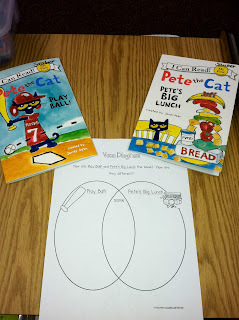 Then we got into pairs and filled in the cute Venn Diagram given to us by the sweet Jennifer White at First Grade Blue Skies. Thanks again Jennifer for putting this together for us. 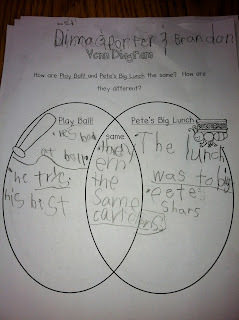 After creating our Venn Diagrams in pairs we shared them on the Apple TV and explained our comparisons to the class. I put under each picture what was shared during that time. PB:His team got a home run. His friends came over for a big baseball tournament. Same: They are cats, They are both blue. 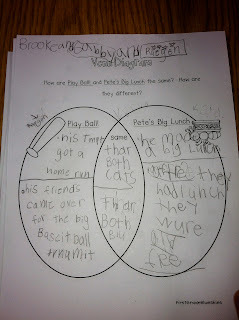 PBL: He made a big lunch. After they had lunch they were all full. PB: He tried his best and he did not care when he got the ball. Same: They are both blue cats. They tried their best. 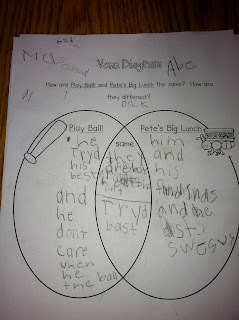 PBL: He and his friends ate sandwiches. PB: He is bad at ball. He tries his best. 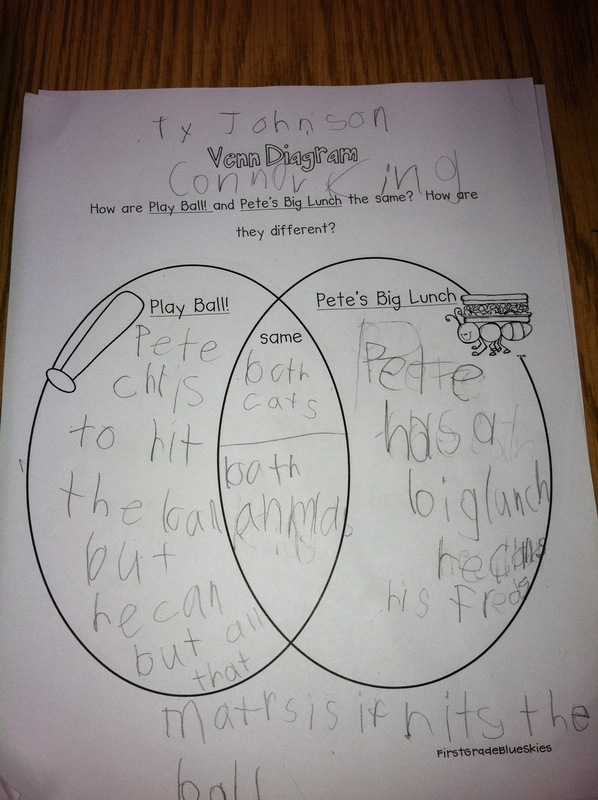 Same: They have the same characters. PBL: The lunch was too big. 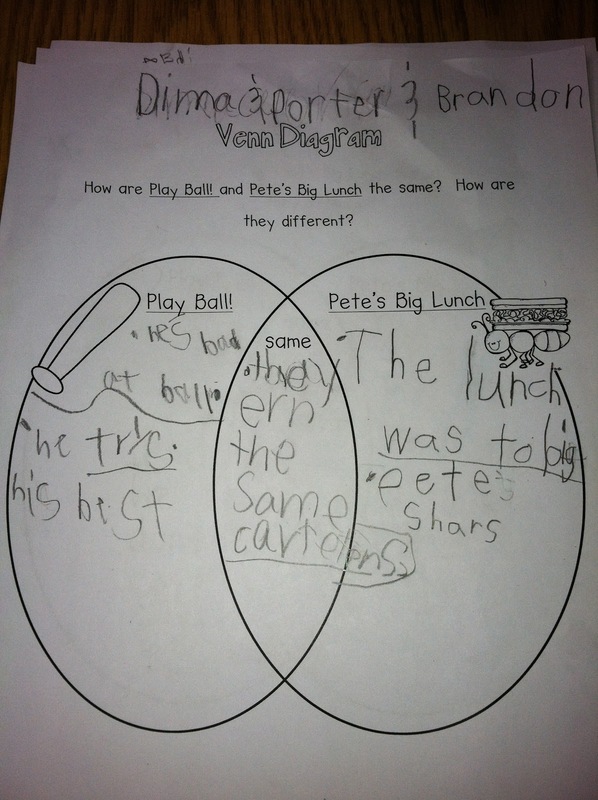 Pete shares. PB: He is nice. He plays ball. The Rocks won. He cheers his team on. 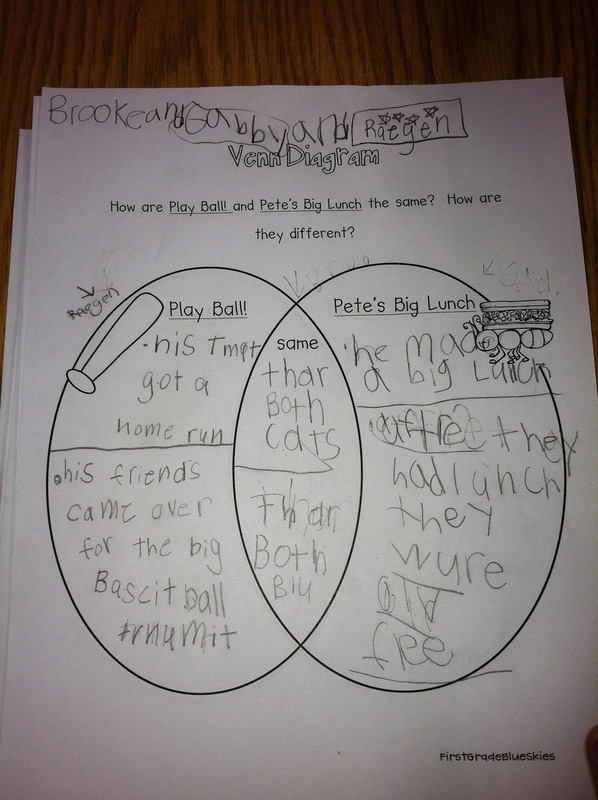 Same: Both are Pete books. Pete tried his best in both books. 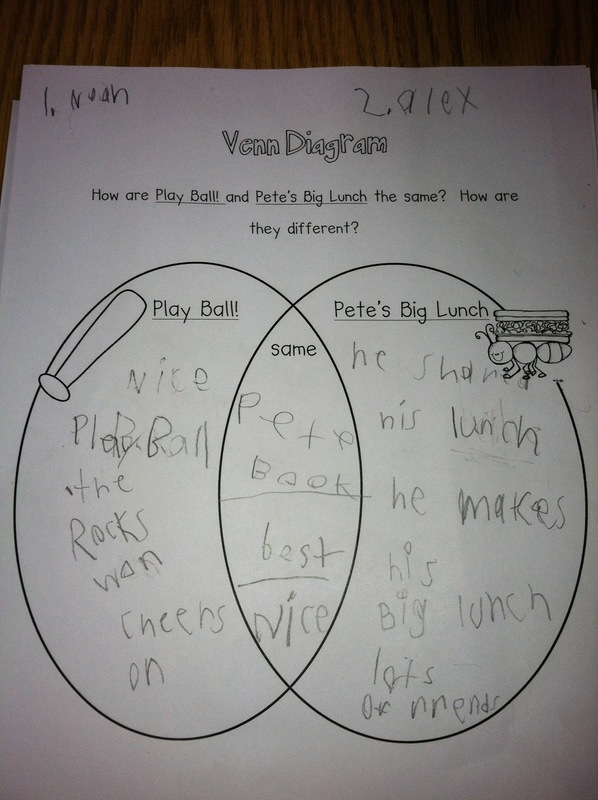 Pete is nice in both books. 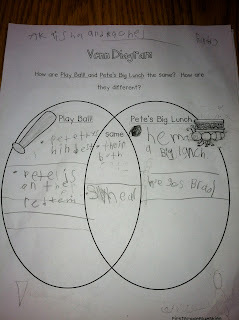 PBL: He shares his lunch. 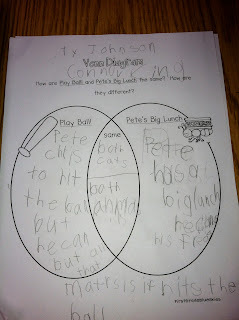 He makes his big lunch with lots of friends. PB: Pete tries his best. Pete is on the red team. Same: They are both cats. 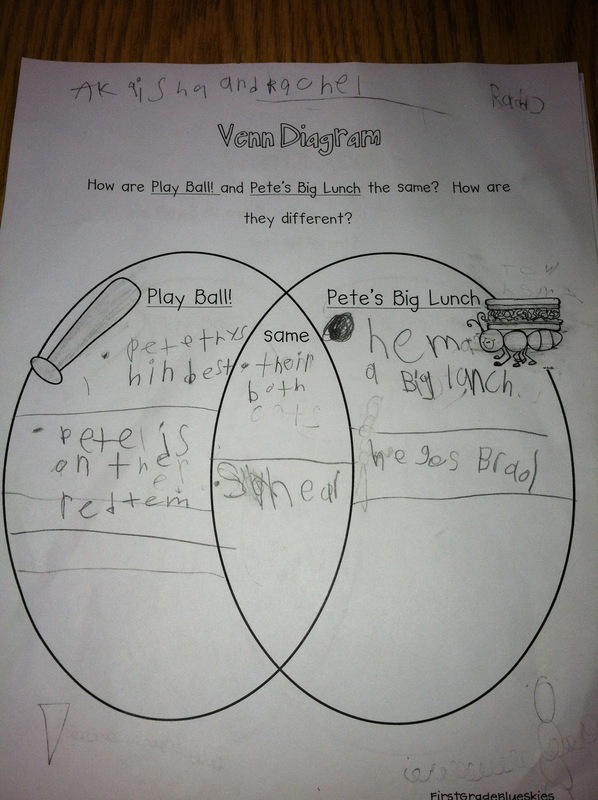 Pete shares in both. 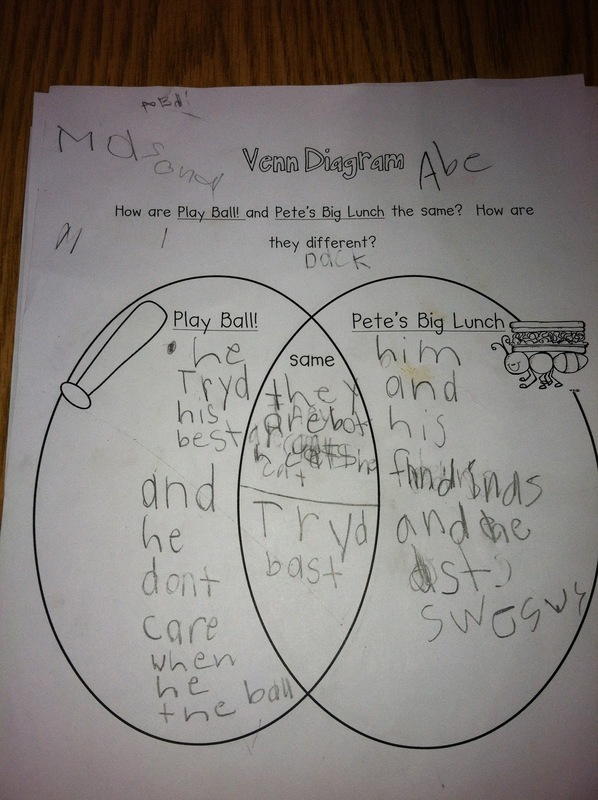 PBL: He makes a big lunch. He gets bread. PB: Pete tries to hit the ball. It does not matter if he hits the ball. Same: Both are cats. Both are animals. 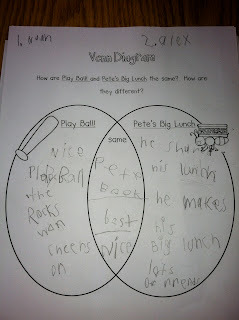 PBL: Pete has a big lunch. He calls his friends. I am thrilled your kids liked the page! !